Aren’t those eyes just adorable? That’s my Eve. And as I mentioned last week, I made her these crochet headbands for Christmas. I could make these headbands in about half an hour or less. So I actually whipped up several of them in various colors. These are great as baby gifts. I plan on making one in all red for my girls to use when dressing up as Snow White. Or for boys, rather than making it a headband, you can turn it into a bow tie by measuring the neck circumference and using a button in the back as a closure. 1. For the headband, measure the size of the child’s head circumference. For Eve at 4 months her head circumference was 16 1/2 inches. To make the headband fit snuggly so it doesn’t fall off, take the head circumference and subtract 1 1/2-inch. That’s the size of your headband. Although, if you are using a type of yarn that has quite a bit of stretch, you will want to subtract 2-inch or 2 1/2-inch depending how much of a stretch it has. chain until the chain length reaches the headband size (head circumference subtract 1/2-inch). hdc (half double crochet) in the second chain from the hook. then hdc in each ch all the way across. turn and ch 2. hdc in each ch all the way across. fasten off but leave a 5-inch tail of yarn. match the two headband ends together. use the 5-inch tail to stitch the ends together. i used a darning needle to stitch. tie it off then cut off excess yarn. weave in any ends. ch 16. sc (single crochet) in second chain from the hook. then sc in each ch all the way across. turn and ch 2. dc in each st all the way across. turn and ch 2. dc in each st all the way across. turn and ch 1. sc in each st all the way across. fasten off. wave in any ends. then pinch the middle lengthwise of the crochet rectangle. using the same color yarn, wrap yarn around the bow at where it is pinched to make the bow center. you will wrap it around many times. weave in yarn end. 4. Attach the bow to the headband. Find where you would like to attach the bow. 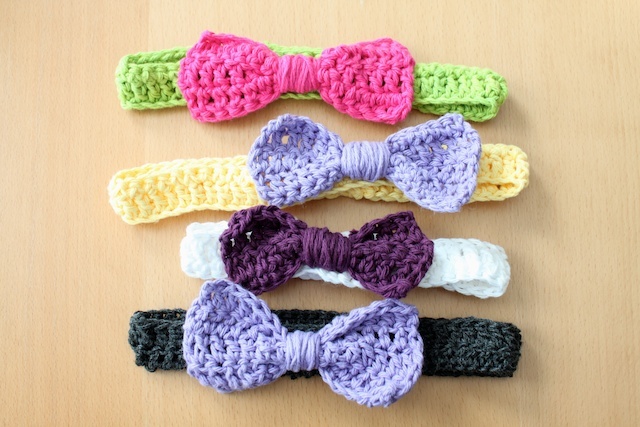 Use the same color yarn as the headband and the darning needle, sew the bow center to the headband. Tie and weave or cut off any long ends. And done! » Tell me… Do you like to crochet? If don’t know how to crochet, do you want to learn? As always, your ideas are just lovely! Couldn’t resist these pretty crochet headbands! would love to try making them. 😉 thank you! 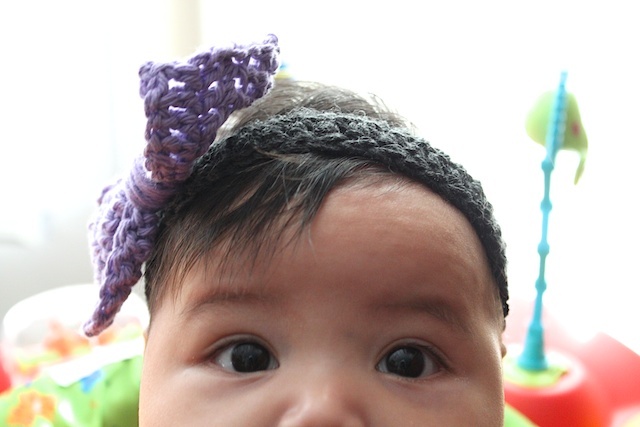 Hi, I’m on the lookout for cute baby crochet patterns as I’m going to be a great-grammy in Sept. Love these headbands. Only ? could you estimate a newborn to age 3mo what there head circumference might be. i would go small since the yarn stretches. so i would probably do around 6-8 inches for the band.